Model for the mechanism of action of Pet309. 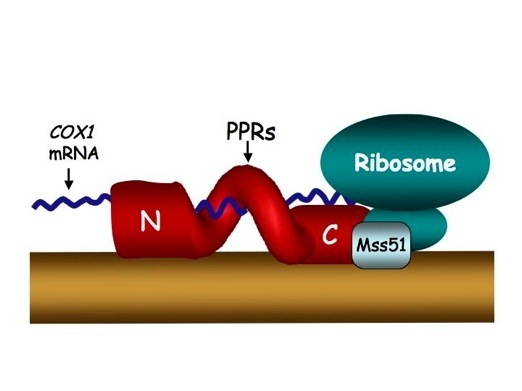 Both, the PPR and the carboxy terminal end are necessary for the COX1 mRNA translation. Structural model for the PPR domain of Pet309. Lateral chains of some of the basic residues facing the inner groove are shown. The substitutions K424A and R427A affect the ability of Pet309 to translate the COX1 mRNA. Each PPR is thought to form two alpha helixes. PPRs are indicated by numbers. Our lab studies the mechanisms that control the amount of Cox1 that is synthesized in mitochondria. Cox1 is the largest subunit of the cytochrome c oxidase (COX), the last electron acceptor of the respiratory chain. Cox1 is encoded by the mitochondrial gene COX1, so the protein has to be synthesized within mitochondrial ribosomes and inserted into the mitochondrial inner membrane. Cox1 is essential for the catalytic activity of the enzyme, as it contains the heme a/heme a3-CuB center. 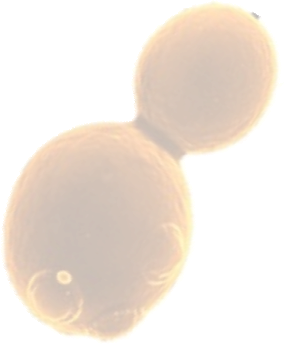 In addition, Cox1 has a central role in the assembly of COX, which is composed of 12 subunits in yeast. The amount of Cox1 protein made in mitochondria is dependent on the assembly state of the COX. In general, mutants where COX assembly is disrupted show a reduced Cox1 synthesis. Our lab is focused in understanding the mechanisms that control this process. 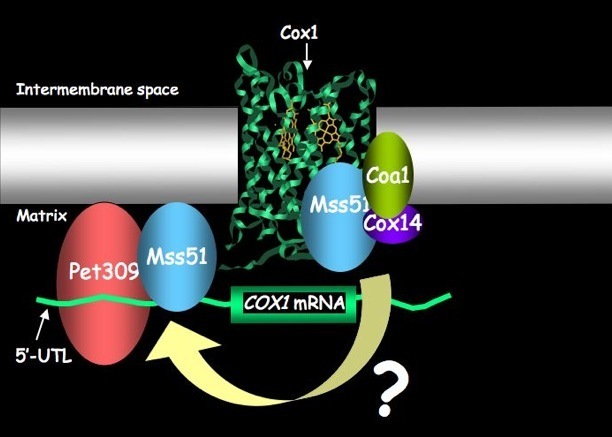 Many factors regulate the biogenesis of Cox1: Mss51 and Pet309 are necessary for translational activation of the COX1 mRNA (3, 5). This step is determinant for the amount of Cox1 made inside mitochondria. 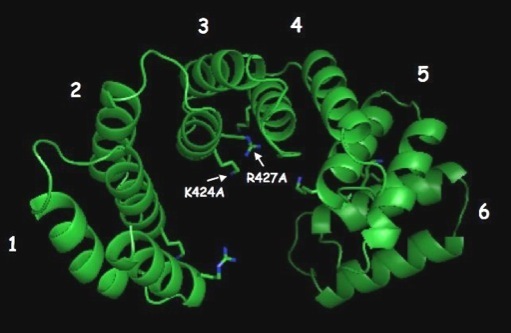 In addition, factors like Mss51, Cox14 and Coa1 are known to interact with the Cox1 protein, and could participate in the coordination of the Cox1 synthesis and assembly (1, 4, 5, 6). Pet309 belongs to the family of translational activators. These proteins act on the 5^ untranslated region (5^-UTL) of their target mRNA in mitochondria to activate translation initiation. The action of Pet309 maps to the 5^-UTL of the COX1 mRNA, and is necessary for translation of this mRNA. In addition Pet309 has a role in the stabilization of the COX1 mRNA. Our observations indicate that Pet309 is a multidomain protein of more than 900 amino acids (8). The central portion of Pet309 contains at least 7 pentatricopeptide repeats (PPRs) arranged in tandem. These repeats are necessary for translation, but not stability of the COX1 mRNA (8). According to structural models of PPR proteins, the PPR repeats in tandem form a helicoidal structure, where the internal groove could be a surface of interaction for RNA (7). Our observations indicate that basic amino acids that are facing the internal groove of the PPR domain are important for the translational activity of Pet309. Pet309 has a large, hydrophilic carboxy terminal portion. We have found that this region is also necessary for Cox1 synthesis. In addition, it affects the stability of the COX1 mRNA. Our current model proposes that the central portion of Pet309 bearing the PPR motifs is necessary for binding of the COX1 mRNA on a sequence-specific manner. The carboxy terminal region of Pet309 could carry the catalytic portion of Pet309, probably by interacting with the small ribosomal subunit (as suggested for some translational activators (2)) or with other factors involved in Cox1 synthesis, like Mss51.